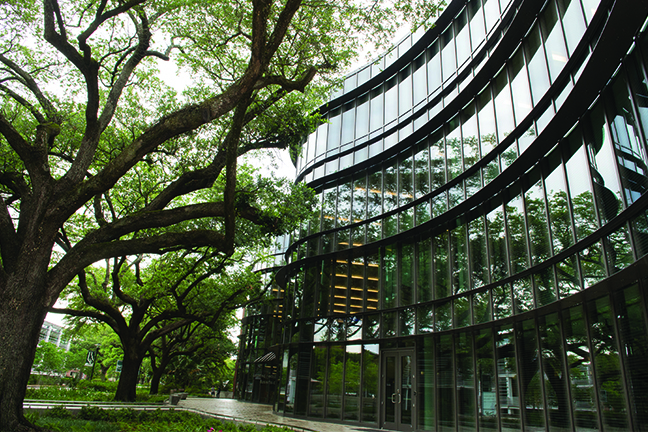 Two additions to the School of Business at Tulane University in New Orleans connect two renovated 46,000-square-foot facilities that once housed separate undergrad and graduate business programs. CHALLENGE: Officials wanted a structure that would put Tulane’s business programs under one roof, but century-old oak trees stood in the way. “We are proud of our oaks, so it was important for us not to take down any trees,” says Randy Philipson, vice president of facilities for campus development and services, of the project planning. SOLUTION: Workers constructed a “wave glass” siding of classrooms and offices that winds around the trees from one building to a newly constructed face of the other without harming one oak. Even the pavement that travels alongside the siding goes over the roots so it doesn’t damage the trees, says Philipson. Inside, workers replaced classroom walls with three-story glass cylinders so people can see courses in session when walking the halls. A back wall was removed to create more visibility. “In some offices where the glass wall is, you can look out and feel like you are in the treetops,” says Philipson. Recent events have challenged institutions to look inward and correct discrepancies between stated protocol and reality. Is your school up for the challenge?